Directed by Meggie Miao. 2006. 59 minutes. In English and Chinese, with English subtitles and voice over. Suffering the pain of exile and the fate of ultimate irrelevance is perhaps a minor tragedy for those brave men and women who dare to challenge those in power. For every Andrei Sakharov and Vaclav Havel who used their international prestige to challenge authoritarian rule directly and who have reaped well-deserved honors and rewards once those regimes were overthrown, there are many other, equally brave if less well-known individuals who labor within the margins of official ideology, trying to open a space for loyal criticism of the regime. Under authoritarian regimes these “reformers from the inside” often suffer no less persecution and exile than do more famous and outspoken dissidents. It would be an historical injustice to forget about these individuals who, rather than seeking to overthrow, have sought to create room for dialogue within the context of dictatorial rule. Perhaps the foremost example of such a person in China was the investigative reporter and writer Liu Binyan (1926-2005). To Tell the Truth: The Liu Binyan Story traces the life and career of the foremost practitioner and perhaps even the founder of the so-called “reportage” school of modern Chinese literature. As far back as the Hundred Flowers Movement of 1956, Liu challenged the Chinese Communist Party (CCP) from within for not living up to its stated ideals. For his troubles, along with hundreds of thousands of other students and intellectuals, he was imprisoned for many years at the start of the CCP’s Anti-Rightist Campaign of 1957. Released from jail and rehabilitated at the start of the reform era in China in the late 1970s and early 1980s, Liu wasted no time getting back to his self-assigned task of investigating the abuses of power and grievances of urban and rural dwellers throughout China as a reporter for the CCP newspaper, People’s Daily. Liu published collections of his articles and essays in the West and signed petitions and wrote articles in support of student demonstrations in the 1980s which culminated in the Tiananmen protests of 1989. 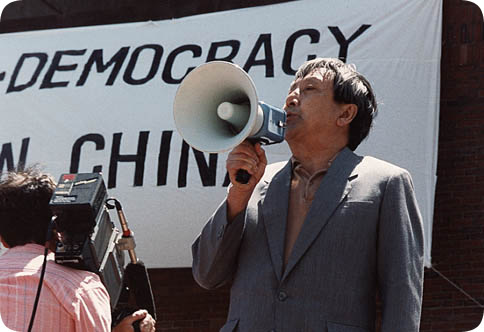 As a result, China sent Liu into exile in the United States, where he finished his days editing a dissident newsletter at Princeton University, trying in effect to lead a loyal social democratic opposition from abroad, until he died of colon cancer on December 5, 2005. The film uses archival footage and interviews with China scholars including Perry Link and key participants in China’s democratic movement, and of course Liu himself and his wife, Zhu Hong. The director and narrator, Meggie Miao, was granted complete access to Liu and his wife and indeed appears by the end of the film to be treated as a member of the family. The best parts of this film include poignant scenes of Liu and his wife trying to make a life for themselves in America in the years after the Tiananmen protests, when memories of the movement had started to fade in both China and the West. In one scene, Liu marvels at the easy availability of all kinds of inexpensive books at a flea market in New Jersey, demonstrating his continuing appreciation for the availability of uncensored writing—this scene may stand out to American students who take such access for granted. This film will be ideal for classes on modern Chinese history, contemporary Chinese society, political advocacy and human rights. In China –related courses, it might be shown in conjunction with a selection of other documentaries such as the China Rising Series produced for BBC and A&E networks, or the PBS series China: A Century of Revolution, both of which include interviews with Liu and other Chinese “critics from within,” including the late philosopher Wang Ruoshui of People’s Daily. Other primary source materials include Liu’s easily accessible and highly readable essays, such as the collection of his reportage literature, People or Monsters? or his memoir, A Higher Kind of Loyalty. In sum, this is a very moving film that takes a very personal approach to the issues of individual liberty. Above all, To Tell the Truth shows by example the need to keep alive the memory of courage of many individual Chinese, such as Liu Binyan, who not only dared to stand alone but who gave the lie by their own example to the claim that Chinese people do not care about democracy and freedom. John A. Rapp teaches comparative politics at Beloit College and carries out research into the political ideology of Chinese dissent from ancient to modern times. How to Purchase: To Tell the Truth: The Liu Binyan Story is available on DVD from The Cinema Guild. Prices are: for universities, colleges and institutions, $295 for purchase and $85 for rental; for K-12, public libraries and select groups, $99.95 for purchase. Prices include institutional public performance rights. China Rising: The Epic History of 20th-Century China. 1996. Directed by Gwyneth Hughs. 150 minutes (in 3 parts of 50 minutes each). Part One: China in Revolution, 1911-1949. 1989. 120 minutes. Part Two: The Mao Years, 1949-1976. 1994. 120 minutes. Part Three: Born Under the Red Flag, 1976-1997. 1997. 120 minutes. Liu, Binyan and Perry Link. 1983. People or Monsters? And Other Stories and Reportage from China After Mao. Bloomington, IN: Indiana University Press. Liu, Binyan. 1990. A Higher Kind of Loyalty: A Memoir by China’s Foremost Journalist. Translated by Zhu Hong. New York: Pantheon.